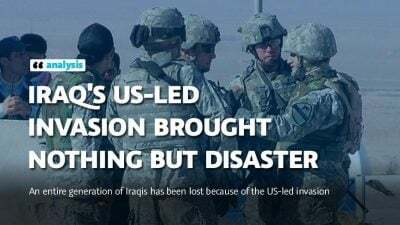 15 years ago, the United States and its allies launched the opening salvos of a devastating military campaign against Iraq that would forever change the face of the Middle East, and have reverberating effects that would affect the entire world. The Baathist dictatorship of Iraq under Saddam Hussein was swiftly toppled, and although Iraqis were promised peace, prosperity and democracy, they received almost nothing but death, terror and chaos. The U.S. did not only aim to destroy the Baathist regime, but also Iraq as a nation and as a multi-ethnic, multi-faith people. Contrary to popular belief, it was not the events of the 9/11 terrorist attacks in New York City that prompted Washington’s desire to enact regime change in Iraq. In 1998, and under the administration of President Bill Clinton, the Iraq Liberation Act was signed into law, and specifically stipulated that it would become U.S. policy to seek to “remove the regime headed by Saddam Hussein” in Iraq, and to support groups opposed to Saddam in order to transition the country from dictatorship to democracy. Some of the groups that Washington had co-opted into its plan were Kurdish separatist political movements, theocratic Shia Islamist parties linked to Iran, and other disgruntled Iraqi opposition groups. Interestingly enough, most of these groups had about as much to do with democracy as cancer does with the notion of good health. Still, the U.S. decided to go hand-in-glove with these groups not because they cared about democracy and human rights in the Middle East, but purely because the regime of Saddam Hussein was not willing to play by Washington’s rules. Following the election of George W. Bush and the tragedy of 9/11, one of the first acts of the Bush administration was to push for war against Iraq. Barely five hours after al-Qaeda terrorists flew a commercial airliner into the Pentagon, Defense Secretary Donald Rumsfeld was issuing orders to his aides to come up with a plan to attack Iraq. This, despite the fact that it would have been impossible for Rumsfeld to determine that Iraq had ordered the terrorist attack, let alone aided and abetted it. This shows an extreme and ideologically fueled predisposition to wanting any excuse to invade Iraq, with a complete disregard for the human cost of such military adventurism. What followed was a series of lies, fabrications and outright deception of the both the international community as well as domestic audiences. The Bush administration began fabricating evidence regarding alleged weapons of mass destruction possessed by Iraq. In Britain, the government of Prime Minister Tony Blair falsified evidence in what became known as the “Dodgy Dossier” that alleged Saddam Hussein could deploy WMDs within 45 minutes, posing a threat to the West. In reality, there were no WMDs, despite the fact that then-Secretary of State Colin Powell openly lied to the United Nations prior to the invasion, and 13 years later called his deception a “blot” on his career. The only thing Powell appeared to be concerned with was the perception of his career, rather than the countless innocent Iraqi lives he helped to take. The invasion itself was nothing short of being absolutely calamitous. The Lancet, a prestigious British medical journal, published a study in 2006 that showed that approximately 655,000 Iraqis had died as a direct result of the invasion. In other words, in less than three years, the United States, al-Qaeda and the sectarian Shia militias loyal to Iran managed to kill a third more people than the Syrian Baathist regime, Russia and more pro-Iran militants managed to kill in Syria in six years of war. To make matters worse for the architects of the illegal invasion, the British defense ministry’s chief scientific adviser said that the study published by The Lancet was “robust”. The U.S. occupation lasted a further five years after the publication of that study, and violent Iran-backed sectarianism, Baghdad-sponsored torture programs and death squads, and Daesh (ISIS) terrorism have managed to claim many more lives since. We should not be surprised if millions of Iraqis have died as a direct result of the invasion, and we should be ashamed that the media has tended to ignore effective coverage of this humanitarian disaster in favor of covering more sensational stories such as Daesh executions and war crimes. An entire generation of Iraqis has been lost because of the US-led invasion. This is unforgivable and, just as Germany was forced to pay reparations for the crimes of the Nazi regime following the Second World War, it would seem only fair that those countries that directly participated in the mass destruction and genocide of the Iraqi people support Iraqis in finally being free of the corrupt political process forced down their throats at gunpoint, and to compensate them so that they can rebuild their country and heal. Otherwise, we all know who to blame for probably the biggest crime of this millennium so far. Tallha Abdulrazaq is a researcher at the University of Exeter’s Strategy and Security Institute and winner of 2015 Al Jazeera Young Researcher Award. His expertise areas are Middle Eastern security and counter-terrorism issues.